Harrisburg enters tonight’s U.S. Open Cup match with Lehigh Valley United Sonic coming off the heels of a pair of tough home losses. Now, they face a Lehigh Valley team that scored a big overtime win last week and is looking to go further than it ever has before in the cup. Shastri Spencer scored the game-winner for Lehigh Valley and earned the nod as The Philly Soccer Page’s Player of the Week. Tonight’s match will play out at Whitehall High School near Allentown, and if you want to see two local teams fight for cup glory, this is a really good chance. Let’s take a look at what Harrisburg has done over the last week. 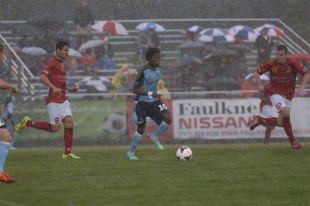 It was a wet, rainy match on a Harrisburg field known to have poor drainage during bad weather. The Islanders’ starting lineup only featured one Union loanee, center back Richie Marquez. This was the first time these clubs have met since Arizona United rebranded this year under new ownership. (They were formerly known as the Phoenix Wolves.) Both teams attempted to use the heavy rain to their advantage in the early minutes of the first half, using long ball over the top that the soggy field would slow down before running out of play. Morgan Langley had the first real chance of the game in the 12th minute, taking down a chipped pass that beat the defense and firing a shot that was too close to the keeper. The field continued to be the best defender throughout the first half as players on both teams slipped in the box, missing out on prime chances for shots on goal. The referee would point to the spot for Arizona in the 19th minute after a tug in the box. Brandon Swartzendruber slotted home an expert penalty into the right corner. Minutes later the referee would make another call inside the box against Harrisburg, but this time he gave an indirect free kick after a tangle of players slipped in the box. The exact infringement that led to the indirect free kick was unclear, but the Islanders wall did it job and blocked the shot. Arizona United continued to dominate possession in the first half through strong midfield play from former Philadelphia Union player Matt Kassel. Harrisburg continued to have problems moving the ball out of their own half, forcing goalkeeper Nick Noble to come up with a number of important saves. The Islanders struggled to link up with each other and continued to pick out poor passes which frequently led to mistakes at the back. Finally in the 44th minute, Morgan Langley was able to use his speed on a counter attack to beat a defender and just missed the far post. The Islanders should have equalized at the beginning of the first half, as Morgan Langley found himself through to the side of goal with the keeper out. Langley did well to pick out a low cross to Edinho Junior who tried to take a second touch at the top of the six yard box instead of putting home a side footer one touch shot into the net. The Arizona defense instead were able to close him down and clear the ball. Harrisburg continued to connect more passes and move the ball around the midfield in the second half, creating better chances and putting pressure on the Arizona goal. Union loanee Jimmy Mclaughlin was subbed on late in a desperate attempt to equalize. In the end, neither team would be able to find the net from open play and the game would end a 1-0 loss. Morgan Langley: He continues to create chances for himself even when the rest of the team isn’t clicking. His speed earns him at least 2-3 clear cut chances every game. If he can improve his finishing, he will be a deadly weapon for Harrisburg. Nick Noble: Didn’t give up a goal from open play. Nick keeps giving the Islanders chances to earn points in games. The strikers need to start scoring goals for him. The Islanders currently sit second to last in the league, with only one win from six matches. Much of the team’s struggles seem to come from a lack of movement and communication between team members. Frequently, players seem to be lost on the ball, whether it is in the midfield or even distributing out of the back line. Questions need to be asked about the team chemistry, and it looks like the lack of a preseason has hurt them. Seven games into the season, however, the preseason excuse may no longer be valid. The team needs to start linking up now if they want to win games. Richie Marquez didn’t look quite as strong as in previous games in the season, but apart from a few slips and slides in the rain he was able to put in a good days shift under horrendous field conditions. Only giving up one goal is normally enough to have your team be in the points at the end of the 90 minutes. Jimmy McLaughlin came on as a late sub when the Islanders were trying to find a goal to steal a point. While he was able to connect some passes, he was unable to get on the score sheet. Marquez and McLaughlin were the only Union loanees to feature. U.S. Open Cup: The Islanders will play their first game of the 2014 U.S. Open Cup in Allentown against the Lehigh Valley United Sonic on May 14th. The team will look to make a charge deep into the knockout tournament after crashing out early last year.